Granite Countertop Designs may vary by picking the right color of granite. Since you do not use only plain white or black color cabinets, wall painting and floor, you have some restricted color choice for granite countertop designs . The ideal coordination is to select granite that contrasts enough with the cabinets and the natural speckles should have the hues of the cabinet color. Remember all granite slabs are like your eye retinas or fingerprints in that no two are alike. This will make your kitchen very special. If you have dark cabinets and then add dark granite the kitchen will be depressed by darkness. If you have light cabinets and then add light granite, pale kitchen brings you a boring feeling. 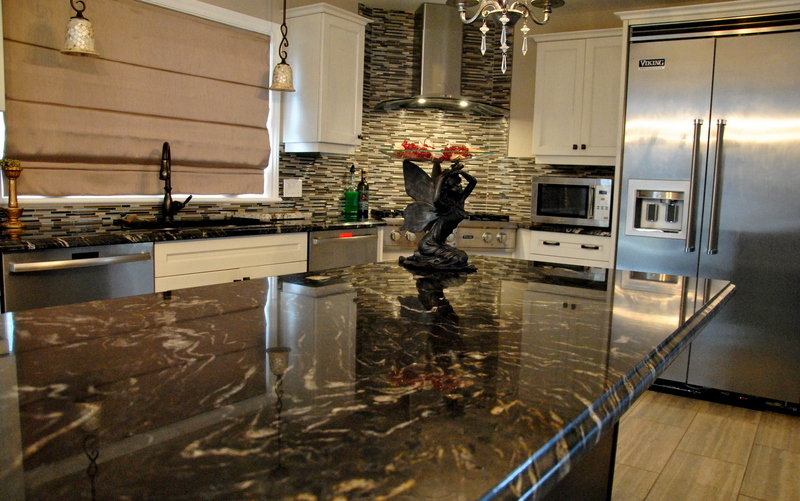 Granite Countertop Designs are like yin and yang. The opposites should stay together. This is the first and most trustable rule for selection of granite countertop designs. In some conditions, smooth transition between cabinets and granite countertop colors make sense. This also works well in kitchen remodeling. The size of your kitchen and lighting: If you live in an apartment, an old townhouse or a single house built before 1950’s, probably you will have a small kitchen. This time you should go for light color cabinets with matching granite countertop colors, which gives a smooth transition, and make a visional delusion. Your kitchen looks bigger after adding these elements. If your small kitchen has a lot of windows and direct sunlight, darker color granite countertop designs can be applied. Picture Credit: Eden Design., You will be in love with the all design elements that are synthesized by a fine and professional eye.The backsplash is a thin veneer brick. The cabinets are clear alder with a Burnt alder stain and glaze. The bar front is bowed to replicate a wine barrel and is faced with 2″ oak planks. The granite is a leathered Capalavaro. Flooring is natural finish Acacia wood. Two different granite color combinations: In granite countertop designs ,the new trend is using two different granite color combinations. This can be used as backsplash and granite countertop together or base cabinets and island. These applications have beautiful results and they can really make a kitchen stand out. Two-color option goes well in large kitchens with a lot of space between the perimeter and the island. Picture Credit:Tinkerthinker. Two color granite countertop designs. Very attractive and very artistic. Cabinet color: It can be white, black, brown, natural, and honey, cherry, light or medium color oak,birch color, mocha and espresso, maple or walnut. Or novelty and any rainbow colors. You can use two different color cabinets, one for the base and another contrast color of island and select your granite countertop that matches well with the two different colored cabinetry . Picture Credit: Cameo Kitchens, Inc. Antique White and Cherry combination of cabinets carry Giallo Napoleon Granite very well in this elegant kitchen. Another option is the base cabinet and wall cabinets are in different colors. Saturnia Granite Countertop with White Kitchen Island and White Base Cabinets. Wall Cabinets are Magnificently Matched. Picture Credit:Kim Duffin for Sublime Architectural Interiors. Base cabinets and island are the same color and wall cabinets are in harmony of gray and blue tones. Very well set up for all elements. Saturnia granite is a plus in this dreamy kitchen. By using two different tone of granite countertop on your two toned cabinets , you can have beautiful result in your kitchen remodeling process. Golden Thunder and Santa Cecilia Granite Countertops on Ameretto Island and Saddle Base Cabinets. Picture Credit:Solid Rock Custom Homes. Both cabinets and granite countertops are two tones. Colors dance in rich fantasy and the result is awesome. You will be very pleased and pampered by having right granite countertop designs at the and of the installation. Please do not hesitate to share your comments.